It was a strange weekend, but I don’t much feel like writing. I’m tired and worn, yet not unpleasantly – kind of like an old blanket on a laundry line in the sun. But Jonah got to swim, and see grandma and the train, and the bite wound he incurred at school is healing very nicely. I also had my first (and last) garage sale on Saturday. Never again. Good God. I thought it would be fun and lucrative, even, perhaps. It was none of that – just hot and never-ending. I probably sold half the stuff in the two hours before the official opening of the sale, while I was setting up. ‘Twas very stressful for someone with my Virgo-ian tendency to have everything just so. I tried to stay enthusiastic and friendly throughout the day. 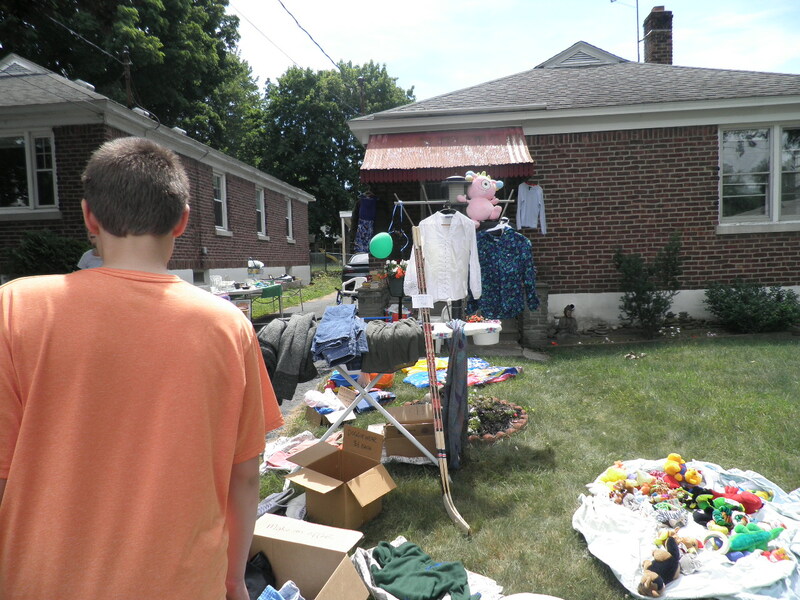 “Welcome to my highly negotiable garage sale!” I shouted like the ringmaster at a circus. “There’s free cold water in a cooler here,” I gestured in tour-guide fashion, “and a cooling station along this wall.” (which was actually a sprinkler, set on low, that I looped over our energy meter). The first two things I sold were the coat racks upon which I’d planned to neatly hang the nicest clothing. The rest of the day pretty much went downhill from there, save for the surprising number of friends, relatives, and co-worker visitors who came to see me and, in some cases, even helped me. 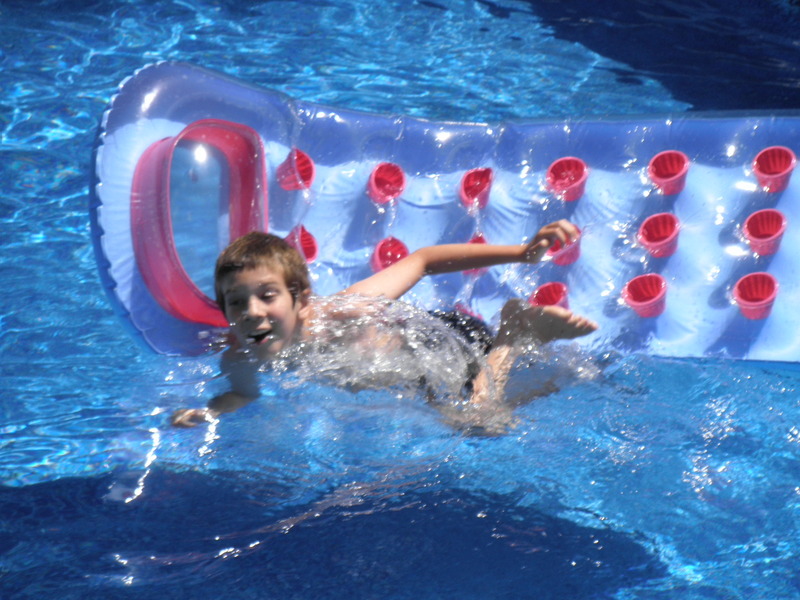 If it weren’t for R’s brilliant product placement, for example, I’d never have sold those water-slip-slides. Never underestimate the ignorance of someone who’s never held a garage sale, or the wisdom of someone like me, whispering in your ear: don’t do it! 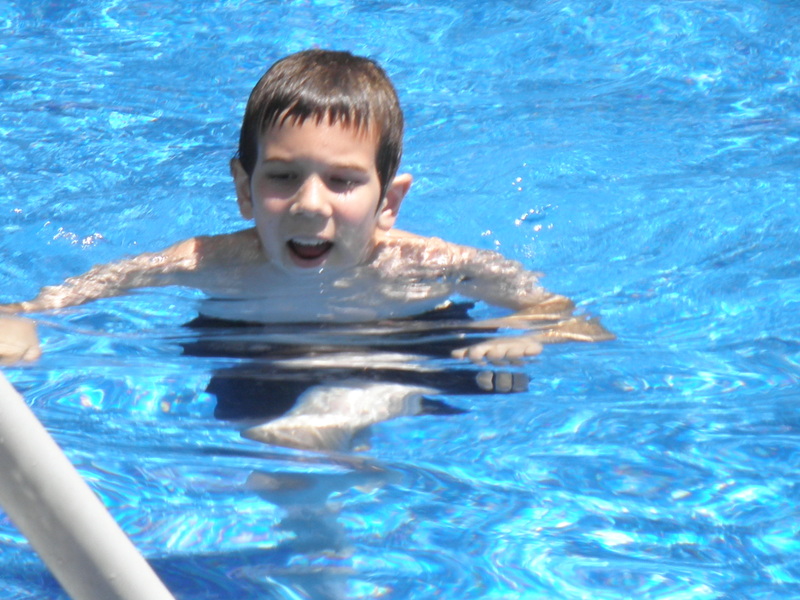 Here are pictures from Boo swimming at grandma’s neighbor’s house, God bless them for all time. Jonah swam, went in to eat, back out to swim, over to see train, and back to grandma’s. He was a joy and had a wonderful time. I’m so glad Andy brought him up to see us on Sunday! I needed to see my little boy. this is so wonderful! what a handsome son you have! love the story glad you are over your sale (ddi one this year I too say NEVER again) LOL thank you so much for sharing your personal pictures and moments with us ! I’m so happy we both have had the same experience with garage sales! My frozen smile stays on my face so long my cheeks hurt. Donna always has some “big” thing she must do on those days. But I have never quite learned my lesson. I always have a box in the basement labeled “garage sale”. “What a fool I am” to quote Eliza Doolittle!